1 Piece Cardboard 12" wide x 7" high. 2 pieces 12" long, 1 1/2" wide, 1/4" thick. 2 pieces 10" long, 1 1/2" wide, 1/4" thick. 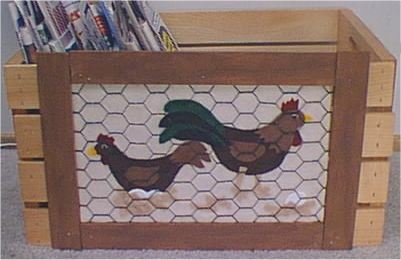 Click and Print each of the links above for the Hen & Rooster cut out patterns needed for this design. Cut out a piece of Ivory colored felt that is 12" wide x 7" high and hot glue it to your pre-cut piece of cardboard. Cut out all the felt pieces for the chicken according to the color & number directions on the patterns. Lay the pieces out on the felt covered cardboard as shown here and hot glue into place. Use small scraps of beige to make a nest. Use a small circle of white or beige for an eye, then use an even smaller circle of black for the pupil of the eye. Cut out a piece of chicken wire that is about 13 1/2" wide and 8 1/2" high. Paint the pieces of wood brown or your desired color. (These will be the window frame) Let dry. After everything has dried, you can begin assembling the window. Nail down the bottom 12" piece of frame wood first as shown, make sure that it is flush with the bottom of the crate/box and that it is overlapping the chicken wire but not the felt design. Next, nail down the top 12" piece of frame wood. Make sure that it is also overlapping the chicken wire but not overlapping the felt design. Nail down both vertical 10" pieces of frame wood. Overlapping the chicken wire but not the felt design. A decorative way to disguise newspapers, weekly ads and magazines in your home. Also makes a great potato bin or fruit bin in the kitchen.